The anniversary couple will love this very special anniversary keepsake. It will be the gift they will cherish and display always. This special anniversary keepsake includes an 8x10 double mat with poem as viewed. Photo is 5 1/2 x 7 1/2. 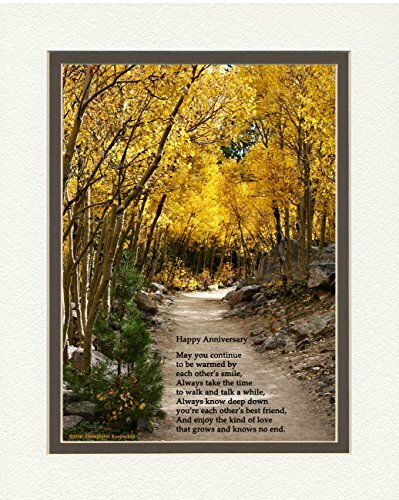 This beautiful photo of a lovely serene path surrounded by aspen trees includes the poem: Happy Anniversary (above poem) May you continue to be warmed by each other's smile, always take time to walk and talk a while, always know deep down you're each other's best friend, and enjoy the kind of love that grows and knows no end. For other photo or poem choices just scroll to the top and click on Anniversary & Wedding Gifts.